SiliconEra has an interview with Shinji Hashimoto, producer of Front Mission Evolved, teasing some sort of cross-promotion with Hideo Kojima and his PlayStation Portable game Metal Gear Solid: Peace Walker. This cross-promotion seems to be in addition to an already announced cross-promotion between the two games, where items unlocked in Peace Walker will be available in Front Mission Evolved, and/or vice versa. Considering the very different nature of the two games’ mecha, I’m wondering how this will actually work; if it’s robot-to-robot part swapping it could look awkward, albeit possibly interesting. 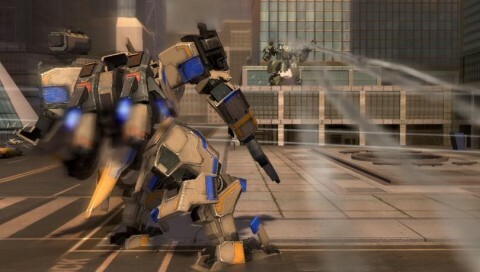 The mecha in Peace Walker are heavy tank-like walkers and reworked versions of Metal Gear Solid 3’s Shagohod, while Front Mission Evolved’s mecha conform more to the Real Robot standard of quick-moving humanoid weapons, equipped with thrusters and ground rollers. I wouldn’t mind the big secret being a face-off against the venerable Metal Gear REX from the original Metal Gear Solid. I’ve been waiting years to go mano-a-mano (well, mecha-to-mecha) against that monster without support from an insane cyborg ninja. Getting help from an insane cyborg ninja always felt like cheating. I played that to death, but I could never get past Prometheus’ stage. I loved playing man against man with my younger brother. Just ditch the mechs and run and gun, haha. They already confirmed that you can’t get out of the wanzer; the on-foot portions are separate missions. Aw really? That blows. *sigh* oh well. It’s no secret that I have next to zero expectations for FM:E.
But the unlocks between this and peace walker are kinda cool, as I already own peace walker. I have to say that the REX/RAY fight in MGS4 was one of the greatest mecha experiences I can recall. I wouldn’t mind if they spun that off into its very own game.